If you can't spare the time to spend two weeks sailing, then the choice of which route is a tricky one. The Kornati route takes you into the Kornati national park, sailing off the beaten track with beautiful uninhabited islands and bays to explore. 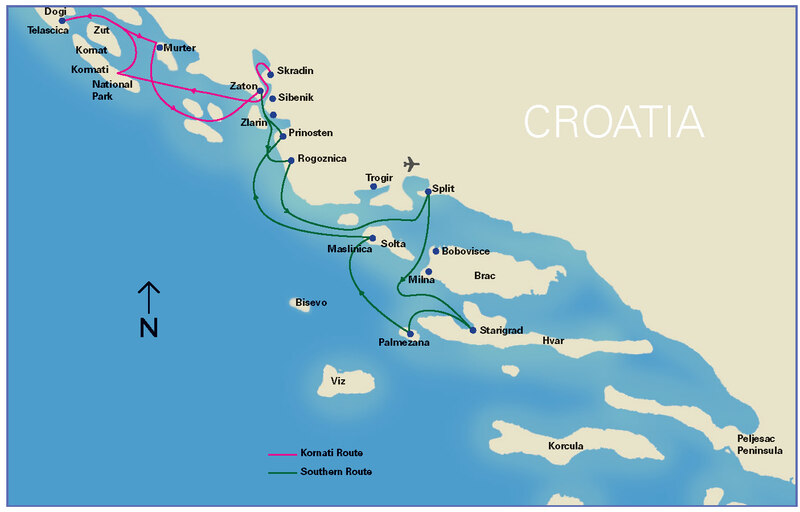 The Southern route takes you to the ports of Split, Starigrad and Milna with some great open water sailing and beautiful anchorages along the way. Whichever you choose, you start and end your this cruise at the beautiful medieval town of Trogir, perfectly situated to explore the Dalmatian coast and the islands. Sunday: Primosten (18nm) –a traditional walled town, oozing character and charm. Enjoy an 'ice breaker' punch party with you fellow crews. Monday: Kornati Opat (24nm) - Sailing in fresh offshore northerly winds and the savouring a fantastic evening meal on the south of this National Park island. Tuesday: Talascica Bay (Dugi Otok) (10nm) – a chance to get away from it all in this well protected bay with a choice of anchorages, restaurant quays and mooring buoys. Wednesday: Skradin (18nm) cruise, under engine or sail if you have the patience through the gorge, up the the pleasant town of Skradin. the next day explore the waterfalls by watertaxi. Thursday: Free sail amongst the myraid of lying islands. Choosing either a quiet cove to dine onboard or visitting one of the many privately run bohemian style restaurants amongst the islands of Zlarin, Prvic or Kaprije. Friday: Trogir Time to explore this historical medieval city; climb the clock tower, medander the cobbled streets and dine in one of the open squares. Two week clients continue sailing on the Southern Route. Sunday: Maslinica, Solta Island ( 11nm) This hidden gem lies on the north western end of the island. Dine ashore under the walls of the small fort. Monday: Starigrad, Hvar Island (21nm) A firm favourite of ours, a town of Greek orgin. Visit the museum, before exploring the numerous bars, cafes and restaurants set amongst cobbled streets. Tuesday: Palmeizana, Pakleni Islands (12nm). safely moored the ACI Marina, take the passenger ferry across to Hvar Town to explore the castle and historical waterfront. Wednesday: Vrboska, Hvar Island (22nm), Cruising east along the northern coast of Hvar we visit Vrboska, a sleepy Croatia town that embraces all the tradition and modern. Thursday: Bobovisce, Brac Island (17nm), When leaving Vrboska visit the sandy out crop at Bol. Take swim in the clear waters before heading on to the tree lined shore at Bobvisce. Friday: Trogir (15nm) - Two week clients continue with free sailing, one week clients join the crew back in Trogir for a farewell evening meal. Saturday flights available from Gatwick, Birmingham, Bristol, Heathrow and Manchester to Split with afternoon returns from the Croatia flotilla base. Direct road transfer to Trogir (ACI Marina) is approximately 15 minutes from Split Airport.